Khoya recipe is one of the easiest dish to prepare but it is labour intensive. 🙂 You do require a lot patience to allow the milk to thicken with no moisture left. Khoya is pronounced differently in different parts of the country. Down South, khoya in telugu is ‘kova’ or ‘khoa, khoya in tamil, kannada and malayalam is also ‘kova’ and another name for khoya in hindi is mawa especially in western states of India like Rajasthan. 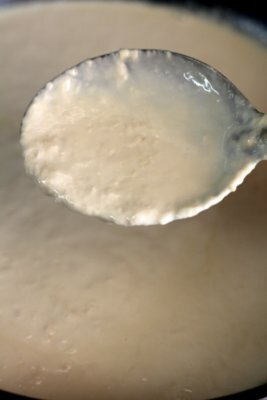 The main and only ingredient to make khoya recipe is full fat milk. Unsweetened khoya is nothing but thick milk solids that are formed by boiling and stirring milk on low flame for a long duration of time. Usually a liter of milk will take more than 2 hours to transform into khoya or mawa. There are three different textures of khoya according to the moisture content that it contains. Khoya in its softest state, with maximum moisture and loose consistency, is called dhapa or chickna (chikna) which is used to make gulab jamun and rabri. 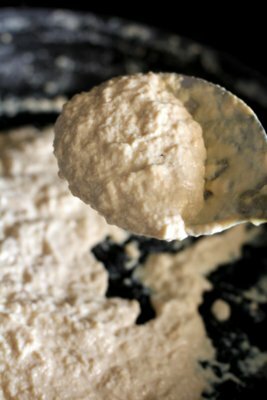 Khoya which is slightly firmer with less moisture and quite grainy in appearance is called danedar and is used to make Indian sweets like kalakand and milk cake. The firmest khoya with no moisture is hard and usually moulded or shaped into small bricks called pindi that is used to make sweets like burfi and laddu. How much khoya do we get from 1 litre milk? You will get about 230 gms to 250 gms of khoya. For those who want to know the measurement of khoya, 1 cup khoya in grams is 200 to 225 (gms). 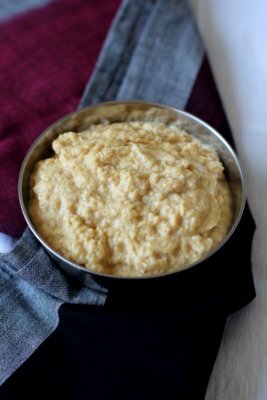 It is best to make khoya at home as store bought is quite expensive and sometimes adulterated. Khoya shelf life is around a week in the refrigerator. 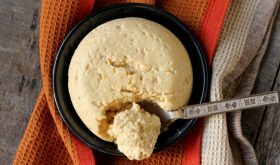 Once khoya reaches room temperature, refrigerate it until use. 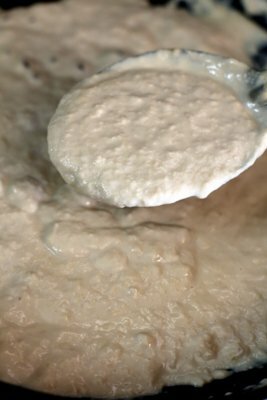 Khoya is prepared with full fat milk but it can also be prepared using either milk powder or ricotta cheese or condensed milk. 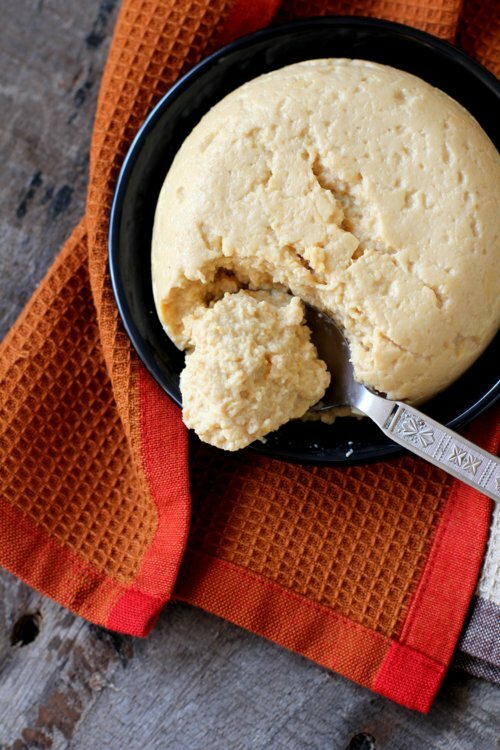 Khoya or mawa is the base for a variety of Indian sweets recipes. Khoya uses are varied and it is used to make both savory rich dishes as well as sweets. Khoya sweets include palkova, khoya peda, khoya burfi, khoya besan burfi, khoya cake, khoya gujiya, khoya gulab jamun, khoya jalebi, khoya ke pede, khoya nariyal laddu, khoya laddu, jain khoya kaju, khoya holige, khoya gajar ka halwa, mathura peda, chocolate burfi. 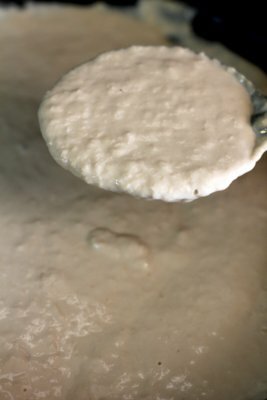 Other khoya dishes are khoya naan, khoya matar, khoya aloo, jain khoya kaju andor khoya kaju in white gravy gujarati style. These are the khoya sweet dishes that I can recall but I’m sure there are many many more. Heat milk in a heavy bottomed vessel on medium flame. Bring to a boil and reduce flame to low and continue to boil milk. Keep stirring every few minutes and remove the top layer that forms. 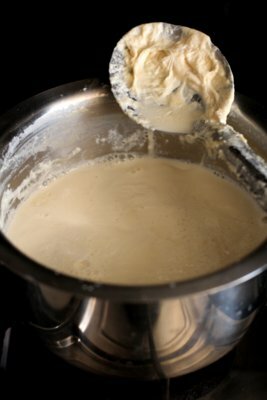 Continue stirring at regular intervals so that the milk does not burn at the bottom. Once in a while, scrape the milk solids that collect at the sides of the vessel. You will find that the milk will appear grainy as it continues to boil. This will occur after 50 mts of boiling of the milk. Keep stirring and scrap the sides of the vessel. Slowly the milk will turn semi-solid from its thick liquid form. Continue stirring and it will take another another hour for it to turn solid with hardly any moisture left. At the end of a little less than 2 hours, it will begin to leave the sides of the vessel. Turn off flame and remove the khoya to another vessel. Bring to room temperature. 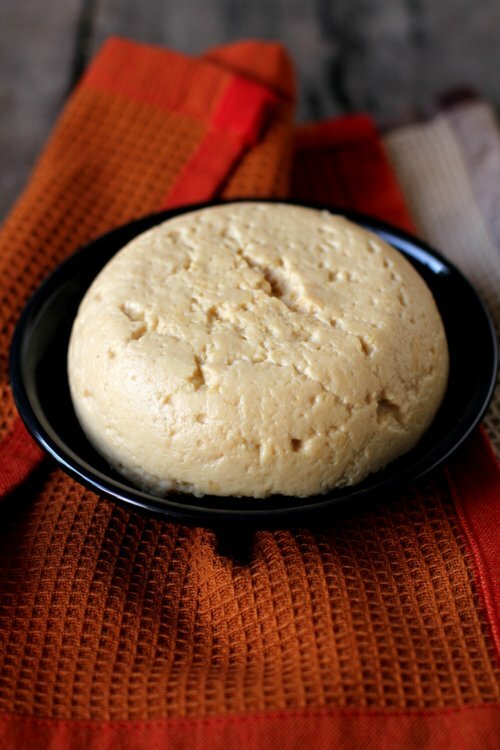 You can use the khoya right away or store in an air tight container and refrigerate it for 4 to 7 days. Alternately, you can freeze for a couple of weeks. Do not boil the milk on medium high or high at any stage. The milk has to boil on low flame at all times. When you stir, ensure that the ladle touches the bottom of the vessel so that the milk does not burn at any point of time. 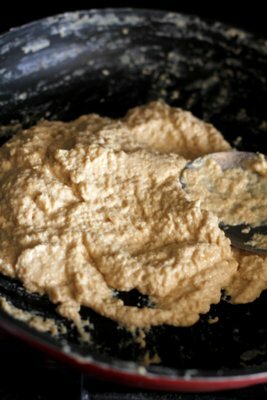 The picture of khoya that you see in this post does have a bit of moisture retained as I am making Kalakand with it. 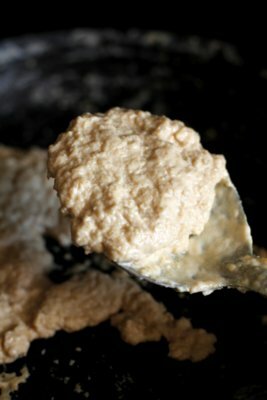 To achieve a complete moisture free, hard khoya continue to cook for another few minutes. By Sailu Published: February 22, 2015 khoya recipe is made by cooking milk till it thickens.learn how to make khoya at home.unsweetened khoya to make indian sweets recipes for festivals, diwali.